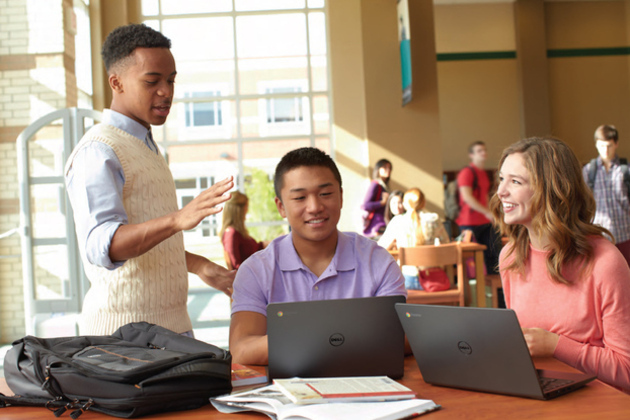 There's a new competitor in the Chromebook market: Dell. This morning, Dell unveiled its first Chrome OS notebook, the Chromebook 11. The sub-$300 laptop is being targeted at schools and students, and will be available next month in both the US and UK. While it's sleek and black on the outside, on the inside its specs only seem to line up with the basic numbers we've been seeing lately inside of other Chromebooks. It includes an Intel Celeron 2955U processor, 16GB of internal storage, options for 2 or 4GB of RAM, and an 11.6-inch, 1366 x 768 display.